We have not yet seen the birth registration of Elizabeth Emma Good. She is counted in the census of 1851 at the age of 6 months and in the census of 1861 at the age of 11 years. The full entries for the census are listed in the page for her father Moses Good which includes his marriage to a second wife, Priscilla Long. Elizabeth Emma is the oldest child that we know of for this union. The indication that she was 6 months of age in 1851 would indicate that she was born in the last few months of 1850, probably in the fourth quarter. IGI, it identifies the father as Edward Alexander Morin Chaffers and the mother as Elizabeth Emma. With the information above it was possible to find some evidence of Edward, Elizabeth and one of the children, Edward Jr. This is interesting as it shows Edward Sr. at his mother's house in Portsmouth with the 3 year old Edward Jr. The name is not the Chaffers we expect, but rather Chaffins. We can see by looking at other records that these must be our people. In this record we see that Edward Sr. has been born about 1832 and the son Edward Jr. in 1868. Elizabeth however is not shown with this family group and the question arises as to where she was -- this is something to be resolved as we have not yet found her in the 1871, 1881, or 1891 census returns. It is interesting that Edward Sr. is shown with no occupation as he is gainfully employed as a Navy paymaster in other returns. Tracing Edward Sr. turned out to be somewhat easier in earlier census returns. E A M Chaffers, age 29, born Halifax, Nova Scotia, Asst Paymaster, single, on vessel Megaera, Cape Finisterre, Coast of Spain - census ref RG9/4440 folio 84 page 9. So, looking at these entries we see that Edward Sr. who married Elizabeth Emma was born in Halifax, Nova Scotia in 1832. By the age of 18 at the time of the 1851 census he was a clerk in the Royal Navy. Ten years later in 1861 he was an assistant paymaster in the RN, which was his assignment at the time of his marriage in 1865. In 1871 he is shown as not having employment and we lose track of him until his death in 1899. "There is more information which I think relates to Edward seniors father - an Edward Main Chaffers is shown on the web as having been on the Beagle with Darwin and a Master of one of the first Royal Navy ships to take english settlers to New Zealand.As Herbert Alexander has the name Main I think there could be a connection. Edward Main is shown as born 1805, died 1845 which would fit with Diana being a widow in 1851." We have not yet found Elizabeth or Edward in the 1871, 1881 census results. Alexander Chaffers, age 59, pauper, widower, clerk, born Nova Scotia and living in the Portsea Island Union Workhouse. Ref is RG12/860 Folio 97 page 15. Samuel Von Schulze Boarder bn 1864 Germany, Merchant. The FreeBMD site has a listing for the death of Edward in Q2 1899 . This is the only death for a person of this name and is likely our Edward, however it would need to be verified to be sure. We note that Elizabeth is a widow by 1901 which is consistent with this death date for Edward. At time of death Edward is 67 years old indicating a birth year of 1832; this would indicate that he was about 33 at the time of his marriage to Elizabeth in 1865, making him about 18 years older than she was. Elizabeth's death is listed as a 1935 death which is the only detail that we have on her death at this time. Diane Purrington and her daughter Vicki, both Moses Good descendents living in Portsmouth, England. Sara Baird, Christine Callow and Sarah Chaplin for providing information on the family from various census and other documents. This document is 'in progress'. Any errors are mine. 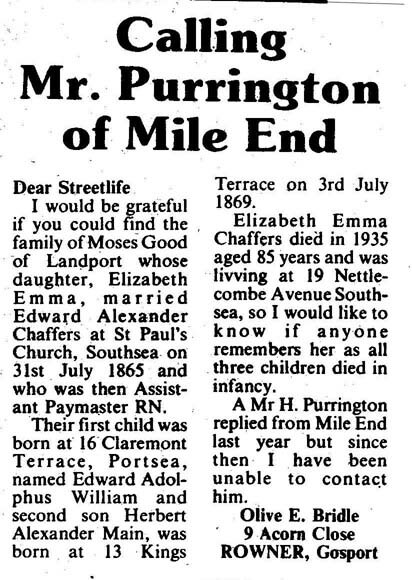 Contributions to this account of Elizabeth Emma Good would be much appreciated.